A rainbow appears at the bottom of the magnificient Skógafoss waterfall in southern Iceland. Here's several views of the famous and monstrous Skógafoss waterfall in Iceland. Situated on the Skógá River the cliffs that created this waterfall were once part of the country's former coastline, now around 5 kilometers away. 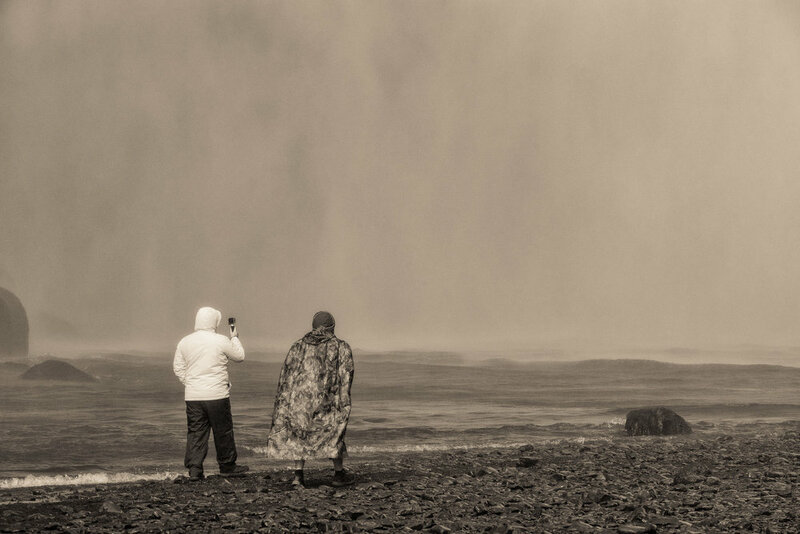 With the massive growth in tourism to Iceland Skógafoss is now an extremely highly touristed location. However, despite the crowds, it's still possible to make decent photos of this mighty waterfall. The awesome power of Skógafoss in southern Iceland is best experienced by those who walk though the mist towards the base of the waterfall. How To Get To Skógafoss? Skógafoss (foss means waterfall in Icelandic) is about 150 kilometers from Iceland's capital city, Reykjavik. 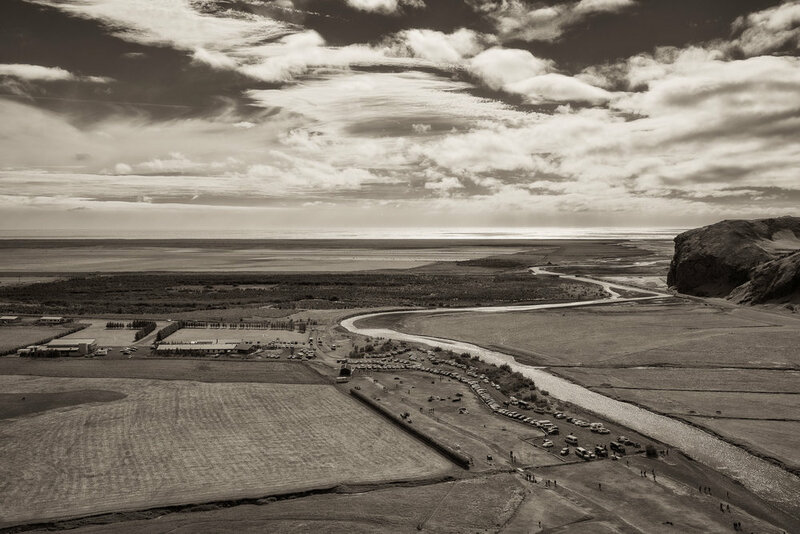 It's a fun and highly interesting drive, but allow plenty of time as these so much to see and photograph along the way. Access to the waterfall is via a fairly flat track of between one to two hundred meters from the carpark. 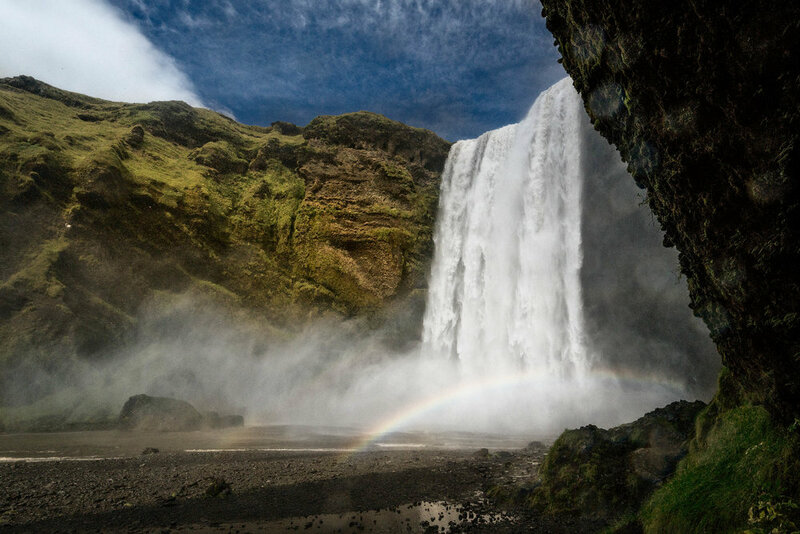 With a drop of 60 meters (i.e., 200 feet) and a width of 15 meters (i.e., 49 feet) Skógafoss throws off an enormous spray, which sunlight often contacts with to produce lovely rainbows in front of the waterfall. It's not uncommon to see double rainbows appearing on a sunny day. Skógafoss features in films such as Thor: The Dark World and The Secret Life Of Walter Mitty. The waterfall also appears in Season 5 of the spectacular series Vikings. A side on view of the spectacular Skógafoss waterfall in southern Iceland. The fact that the waterfall is set back from the carpark provides plenty of space for folks to find interesting vantage points for their photos. Standing back will allow you to fit the whole waterfall into your viewfinder while using the river as a compositional device to lead the viewer's eye into the frame. On the right had side of the waterfall there's a fairly steep path up to the top of the falls. It's a path for some of the way and metal steps for the rest. You'll want to stop and, pretending to admire the view, catch your breath a few times on the way up. Still, it's only about a five to ten minute climb to the top. A view across the top of Skógafoss waterfall in southern Iceland. The view on the way up is worthwhile as it places the waterfall in the surrounding landscape and also allows you to tell the story of just how busy this place gets. Once you've reached the top of your climb there's a platform from which you'll have the ability to photograph across the top of the waterfall or back up river. Those images speak of the beauty of nature and tell a very different story compared to looking back in the direction you've come. Looking down from the top of the mighty Skógafoss waterfall to the carpark and the Skógá River in southern Iceland. 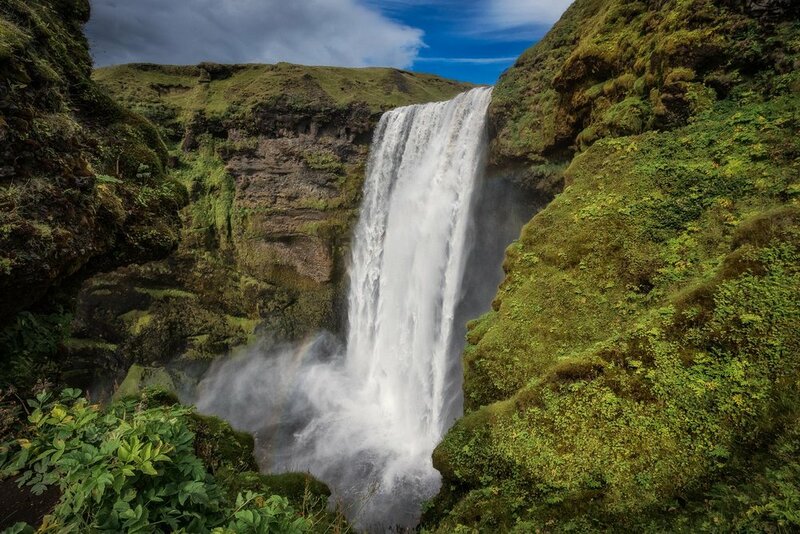 Is Skógafoss Worth Your Time And Energy? If it's your first visit to Iceland I'd definitely recommend a visit to Skógafoss. It's such a well known location and there's always plenty of water flowing over the falls. Due to its size and the massive amounts of spray it generates, it can be quite an exciting place to visit. However, it's by no means Iceland's most beautiful waterfall. I've had the good fortune to photograph Skógafoss on two separate trips. Will I re-visit on my next trip? That depends on my itinerary and how long I have in the country. If the time were short I'd move on as there are so many other amazing places to photograph in Iceland, and they're not as busy as Skógafoss. However, if I return during the winter season, it would be fascinating to see Skógafoss set amid a snow covered landscape. I think that could be quite a special experience. One that would provide me with opportunities for great photos. Travel And Photography In Iceland | Is It For You?